What could be more rewarding than seeing elderly relatives enjoying a gift together? After years of marriage, seeing two people in love enjoying something together is a beautiful thing. Knowing exactly what to give them can sometimes be tough though. Here’s some food for thought so you can pick something that will really put smiles on those wrinkly old faces. It’s often the case that as couples get older, they tend to leave the house less and less. This may not always be down to mobility issues or that they simply prefer the comfort of their home, and so if this is the case then consider a gift that provides them with a change of scenery for a day or two. If they both enjoy nature, and find walking easy, consider a light hiking holiday or nature walk. There’s a wealth of beautiful locations around the country that they may not yet have had the pleasure of visiting and even more places abroad for those with a slightly higher budget. Most grandparents are at the age where they can afford to really take a break and smell the roses, so it seems a shame for them not to take advantage and really experience everything the countryside has to offer. If nature isn’t really your grandparents’ thing, ask yourself if they might enjoy a bit of an old school road trip together. A car hire company specialising in classic sports cars such as the Jaguar E Type or MGB Roadster could really take them back to their youth, get some wind through their hair and make them feel as though they were courting again. A nice touch for this gift would be to plot the route for them, including some of their favourite or most memorable locations. For example you could have them visit the houses they grew up in as children, followed by the place where they first met, followed by the place where they raised their own children. When you’ve lived as long as most grandparents have, you often acquire a taste for the finer things in life. Whether it’s wine, good food or great literature, the passing years can bring a refined appreciation of high quality. If this sounds like the case with your grandparents, a selection of all their favourite things could really brighten up their day, showing that you’ve taken the time to think of all the things they love. Champagne, wine, whisky, pate, biscuits, cheese, smoked salmon, poetry and cigars are just some of the things that you could include in a nicely presented wicker gift hamper. Remember to try and include an even selection of things for each grandparent if they tend to like different things. 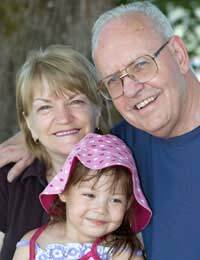 Grandparents are often too busy being interested in what their children and grandchildren are up to to worry about themselves. If this is the case, then give them something that reminds them of their loved ones. For example, you could create a collage of photos of yourself, your siblings and your cousins. This is a gift that really shows thoughtfulness and one most grandparents would absolutely adore. If you’re not so good with scissors and glue you could even splash out on a digital photo frame, saving all your best snaps onto a removable memory disk, giving them a digital slideshow of all their favourite family members and best memories of them. If your grandparents live far away or you simply don’t find the time to see them very often, consider a gift that will help them keep in touch more easily. For example, you could treat them to a computer literacy course enabling them to stay in touch via e-mail or through a social networking site. You could even buy them a webcam so they can send you pictures and video messages.